The Wisconsin Field Crops Pathology Crew scouted winter wheat near Sharon, Wisconsin and Arlington Wisconsin yesterday. Wheat in these locations ranges from emerging flag leaf (Feekes 8) to boot stage (Feekes 10). Stripe rust (Figure 1) is increasing in incidence in the Sharon location while the overall severity (area of leaf covered by yellow spore-producing pustules) remains low. At the Arlington location, susceptible varieties in the uniform variety trial have high incidence and high severity with damage already reaching flag leaves. Wheat in surrounding fields is also beginning to show higher levels of stripe rust incidence. As previously mentioned in my May 11 post, stripe rust can be very yield limiting when it advances to the flag leaves before head emergence. Humid conditions and rainy weather will provide conditions favorable for stripe rust increase over the next week. Now is the time to scout winter wheat fields in the state and determine the incidence and severity of stripe rust in the lower canopy. By scouting the lower canopy, you can get an idea of how much risk there will be for stripe rust moving up to the flag leaf. 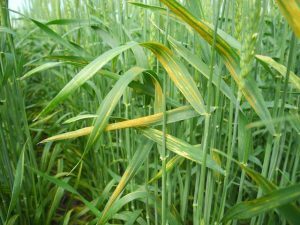 Fungicides will be most effective when applied to wheat before stripe rust advances to the flag leaf. While scouting also note the growth stage of the wheat crop. This will be helpful in making fungicide application decisions. To add fuel to the fire, we also need to start thinking about Fusarium head blight (FHB) or scab. Within a week or so, there will likely be fully emerged heads with anthers present on some wheat varieties in the southern and south-central region of Wisconsin. This will be a critical time to make a decision about fungicide application to control FHB. Currently, the Wheat Scab Advisor is showing little risk for FHB (Figure 2). I would urge you to pay attention to the weather over the next week. We are about to enter a warm rainy period, which will be conducive for the FHB fungus, should heads emerge and anthesis begin during this time. The Wheat Scab Advisor will likely change quickly during this period. A fungicide may be needed especially on susceptible cultivars to control FHB and reduce DON (vomitoxin) contamination. The fungicides Prosaro or Caramba have both performed well on FHB in Wisconsin. Timing of application of these products is critical. I would urge you to wait until anthesis has begun in your field before applying. We have observed poor control where application of these effective fungicides were made before anthesis. In fact, we have observed improved control of FHB and lower levels of DON in finished grain where fungicide application was delayed 4-5 days after the beginning of anthesis, compared to applications at the start of anthesis. Data from a fungicide efficacy trial to support this observation can be found by clicking here and scrolling down to pages 16 and 17. Also, remember that application of fungicides should be made no later than 6-7 days after the start of anthesis. After this time, fungicide efficacy on FHB is much reduced. So now if you are still reading this, you are probably asking yourself “Well Damon, when should I spray fungicide now that I have two diseases to worry about and wheat is only worth $4/bu?” My advice here will involve some leg work. I think folks need to see how much stripe rust is present this week and what growth stage the crop is at. If there is little rust present and the crop will be heading and going through anthesis in the next week or so, I would say to wait and target your fungicide application for FHB control. Both Prosaro and Caramba are rated “Excellent” in the University Small Grains Fungicide Efficacy Table. Therefore, if you wait to spray, you are still applying a product that can protect flag leaves should stripe rust move in later. Also consider the level of resistance to stripe rust in your wheat variety. If the variety has a decent level of resistance, then the rate of spread of stripe rust up the canopy will be slow relative to susceptible varieties. If the crop is only at the emerging flag leaf stage and you find active stripe rust in the crop, I would not wait to spray at anthesis. 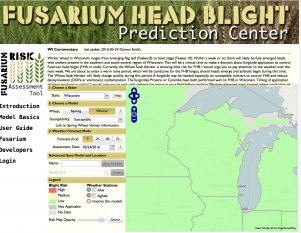 This could result in significant levels of stripe rust on flag leaves on susceptible or moderately susceptible varieties considering the conducive weather pattern that is forecast for Wisconsin. A strobilurin fungicide such as Headline or Aproach might be useful as a preventative application for stripe rust and these products are in a different class as Prosaro or Caramba. You should be aware that solo strobilurin fungicides do not perform well on stripe rust once the disease is established. A triazole or mixed-mode-of-action fungicide might be needed in this case, but be aware that could limit your use of Prosaro or Caramba for FHB management later in the season. Consult the fungicide labels carefully. We have also had a couple reports of low levels of powdery mildew in a handful of fields and Septoria leaf blotch continues to cook along in the lower canopy in most fields. Stay diligent with scouting over the next couple of weeks and keep an eye on the weather. Hopefully we get enough rain to keep the crop moving along nicely and not enough to make disease worse. SCOUT, SCOUT, SCOUT!!! Next post: Strip-Tillage: How does it affect yield in Wisconsin?